Connie Ray, Mia Katigbak and Ella Dershowitz in Card and Gift. Photo by Tina Fineberg. BOTTOM LINE: Three lonely women try to find some connection to the world in a small gift shop. Life in small town America has its perks. It’s quiet, everyone knows you, yet you also have plenty of personal space. Of course, small town living in America has its flaws, too. It’s quiet, everyone knows you, yet life is lonely. Thus is the paradox presented in Kate E. Ryan’s Card and Gift through the lenses of three desperately lonely women. 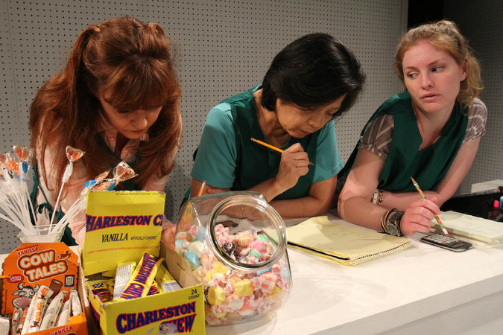 Over the course of the play these women develop a strange friendship founded on their mutual loneliness. As a year passes we catch snippets of how they try to support each other, but each is a reflection of the others' hopelessness. One of my favorite scenes is when the three women are going about their business when suddenly Shana has a nightmarish vision of Lila and Annette as old women running shop – is this what they’ll become should they stay in this dusty store the rest of their lives? Is this what she’ll become if she stays in this small town the rest of her life? Katigbak, Ray, and Dershowitz play these women with gentle care. It takes only the smallest gestures to show us how much they want and how little they believe their wants can be achieved. Lila shuffles around the stage with an air of perpetual despondence, haunted by her identity as a failed artist. Shana’s sporadic attention span speaks to her aimlessness, of which she is very self-aware. There’s a moment when she asks the women where they want to be, and after their silent responses Shana admits guiltily she has no idea. Annette’s perkiness, though sincere, is colored with desperation. This already stands in stark contrast with her grounded husband Mick (Scott Sowers), but her want is inflamed during election season when she immerses herself in the campaign of Diana Boss – a faint echo of Sarah Palin. She wants to believe in Diana’s views on love and teaching so badly Annette eventually loses focus on the rest of the world, including her own friendships. Despite their want for connection, these three women turn out to be clumsy at supporting each other. And they only grow more distant as they are presented with the occasional nightmares (staged beautifully by Les Dickert’s lighting design). Another notable performance in these nightmares is the impeccable Laura Esterman as two different characters who taunt Annette and Lila. Card and Gift presents us a unique mirror into what may be our own fears of loneliness. But it runs a very fine line between reflecting our own disconnects and actually disconnecting us from the show itself. Diana Boss’s campaign, though an interesting segue to issues of corporate greed and political corruption, sometimes feels so out of place the audience is taken out of the world Ryan has so delicately pieced together. Part of Clubbed Thumb Summerworks, Card and Gift is part of the company’s repertoire of thoughtful and challenging works. If you missed Jerry Lieblich’s D Deb Debbie Deborah, here’s another chance to get a taste for what Clubbed Thumb is all about.